Are you a Law of Attraction practitioner? 15 Minute Manifestation is today’s solution to improve your mindset for manifesting your goals. It combines and utilizes the latest NLP, hypnosis and brainwave entrainment technologies. Do you agree? That your Attention is what manifests your Reality. It is NOT your intentions, hope, wishes, declarations or affirmation. "Why doesn't the Law Of Attraction work for me?" To get lasting change and results, we must remove the negative beliefs and limiting thinking that is in our subconscious mind. For programs that do not target the subconscious mind, it is no surprise that they do not work. 15 Minute Manifestation is a 21-day program that takes you just 15 minutes a day. The main program consists of three audio tracks. You simply listen to each track for a week, before moving on to the next track. 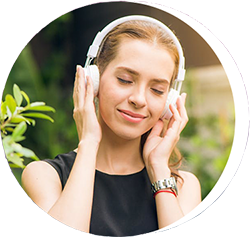 The audio tracks are created using hemispheric synchronization technology audio, and blended with high-quality, real nature sounds like rain, ocean waves, streambeds and wind, for a truly unique and immersive listening experience. Tracks work on any computers, laptop, smart phone, or devices that can play audio-MP3 format files. From the minute I put on my headphones, I instantly felt a different INSIDE my head! It was like my brain felt alive and in tune...in a way I’d never experienced. It was crazy. The most amazing part was, within the first week, I could absolutely tell a difference in what I was manifesting. I had attracted and closed two HUGE contracts! Cha-ching! Using your frequencies has felt like the changing of the seasons...like from winter to spring...only it didn’t take months and months. I’ve got abundance popping up like flowers everywhere in my life. Thank you, thank you, thank you! A 7-Minute MP3 audio to give you a quick boost of motivation, whenever you need it! 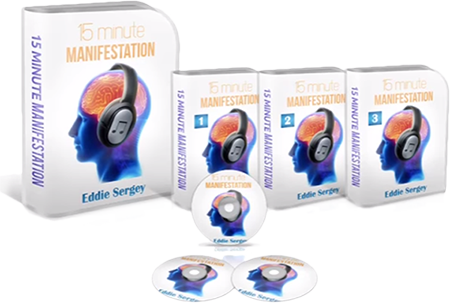 You will receive a download link for the MP3 audio, together with a Free subscription to our Manifestation Newsletter by Eddie Sergey. The newsletter is included free-of-charge, and you are free to opt-out from the newsletter anytime you want.